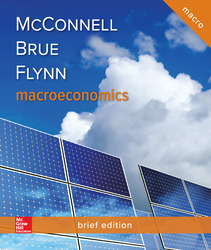 McConnell, Brue and Flynn’s Macroeconomics: Brief Edition, 3e comes from the same author team as the market-leading Principles of Macroeconomics textbook. Macroeconomics: Brief Edition tailors the core concepts from proven leader Macroeconomics, 21st edition to create a concise introduction to the course that is distinct in purpose, style, and coverage. Like the 21st edition, Macroeconomics: Brief Edition, 3e continues to be innovative while teaching students in a clear, unbiased way.